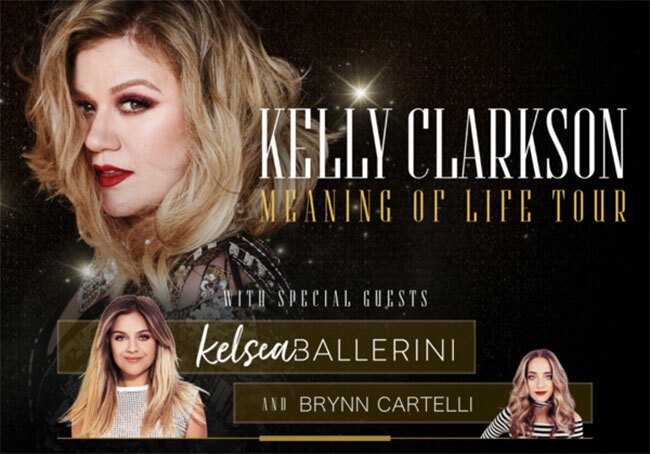 Kelly Clarkson has announced the all female Meaning of Life Tour for 2019. Joining her are Kelsea Ballerini and The Voice Season 14 winner Brynn Cartelli. The tour was announced during a Smule video published on Twitter earlier today (Fri, Sept 14th). The trek kicks off January 24th in Oakland with stops in Fresno, Los Angeles, Nashville, St. Louis, Allentown, Indianapolis and more before wrapping March 30th in Greenville, SC. The full tour itinerary is below. Pre-sale tickets are available starting Monday, September 17th at 10 am local time via Clarkson’s website. Tickets will go on sale to the general public on Monday, September 24th. VIP packages will also be available that include prime seating, drinks, exclusive merchandise and more.